molesworth furniture, reproductions made by you! 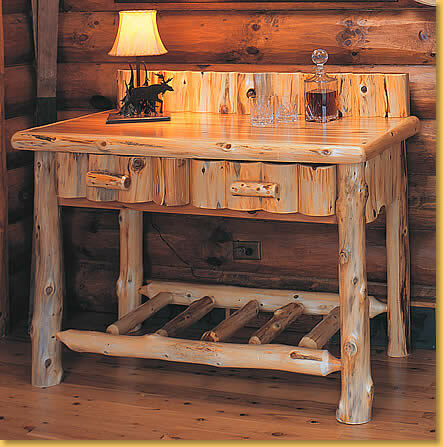 Copy WYOMING cowboy style furniture as it's HIGHLY HOT right now. It is made of peeled pine, so can be reproduced in TAIWAN or in DETROIT, anywhere you have PINE TREES falling down. Molesworth made unusual stuff in the mid 30's, using burl and branches, stripping the bark off but leaving its rustic contours to decorate and texture the pieces. A small cabinet today costs $14,000 The image above, being bigger, would probably go for twice that. The owner of FIGHTING BEAR wrote the book on this fabulous, unique artisan. He also sells the furniture at top collector prices, and apparently, it's SUPER HOT these days! but he does it in a subdued NEW YORK manner, very tasteful. CHIC! 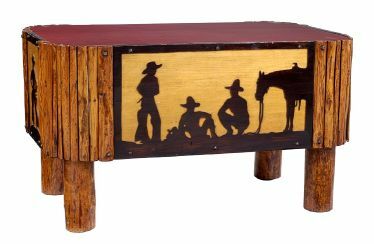 rustic, cowboy furniture in the middle of Boston or L.A. using 'found' branches. Or you could make it in Taiwan or China and use their rustic pine branches. so get started now, woodworkers, before it gets ROCKY MOUNTAIN RED CHILE HOT! out what you see, hang it on your design bulletin board, then hit the forest with a saw and a truck.